Location: Late blight was confirmed on actively sporulating leaf lesions from an 70 acre processing tomato field outside of Elmer, NJ. All lesions were found on the upper most leaves in the canopy suggesting Late blight was carried in from an outside source. 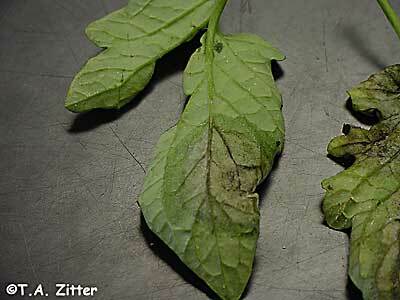 This is the second report of Late blight in NJ on potato or tomato this year. Grower Action Plan: Control of late blight begins with regular scouting, recognizing symptoms and preventative fungicide applications. All potato and tomato growers in NJ should scout fields and include a late blight specific fungicide in their regular fungicide program. Although the weather this past week has not been ideal for late blight development in many areas of NJ (i.e., too hot), weather this coming week is going to be considerably cooler in the evenings and overnight.